The Biblical account of the miraculous birth of Jesus Christ, the only begotten Son of God, when God became a man and dwelt among us, is provided in Matthew chapters 1 & 2, Luke 1 & 2, and John 1. I recommend that everybody read these great passages with their families this Christmas day. The purpose of His coming was that we might know God, recognize that we are separated from God because of our sinful nature and sins, and be our Savior - to save us from our sins so that we would not perish, but rather, could have eternal life. 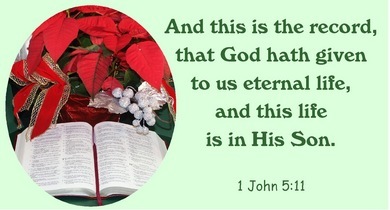 The key to eternal life was provided by Jesus in the preceding 15 verses of the chapter (John 3:1-15). In that passage Jesus tells Nicodemus, a righteous man of the Jews, that unless he is born again he will not enter the kingdom of God. Like Nicodemus, we must all be born again from above in order to receive eternal life. 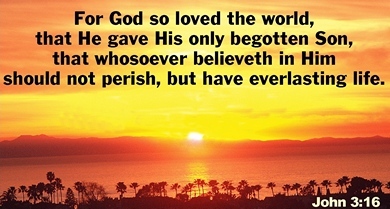 We do nothing to earn eternal life, but rather, it is a free gift from God because he loves us so much. 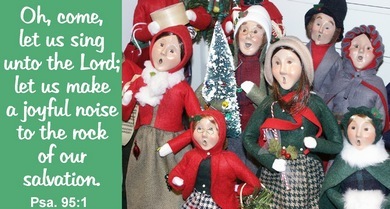 So the Christmas story is a wonderful love story telling of God's immeasurable love for us. His Christmas gift was to give us His Son, Jesus, who would grow up keeping all points of God's law perfectly (which we all have failed to do). He would then die on the cross in our place, and rise again from the dead on the third day, so that we who place our trust in Him might be forgiven our sins and live with Him forever. He was born into the world so that we might be reborn through faith in Him. What a great Christmas present!!! However, God's work doesn't end there. In fact, it is only the beginning! The fear of the Lord is the Beginning of wisdom. (Proverbs 9:10) Following the believer's new birth, God begins a work of sanctification - causing us to change from the inside out - to be holy, separated for service to God and obedient to his commandments. This is a life-long process! The good news is we can trust in God's promises that - He which has begun a good work in you will perform it unto the day of Jesus Christ (He will complete it); He is the author and finisher of our faith; and I will never leave thee nor forsake thee! (Phil 1:6, Hebrews 12:2, Hebrews 13:5). One day, perhaps very soon, all believers will stand before our Father in Heaven - without spot or wrinkle (free from sin)- reflecting the complete and perfect work of God in our lives! We will forever thank and praise him for the marvelous work He has done in saving us, fashioning and fitting us for our eternal life with Him! All Praise, honor and glory be to God our Father and to our Lord Jesus Christ! The grace of our Lord Jesus Christ be with you all. will ask Jesus into your heart without delay and receive the gift of eternal life! I want to ask Jesus into my heart right now!! and the True Spirit of Christmas. We pray you will continue to grow in your knowledge of the Lord Jesus Christ and that He will bless and use your life in a special way according to His good intentions concerning you. Love in the precious name of Jesus!